International borders sit at the intersection of trade and travel flows, immigration processes, national security concerns and transportation functions. Over the past decade, political, social and economic events have affected the cross-border movement of goods, people, services and information, resulting in altered flows and economic consequences. 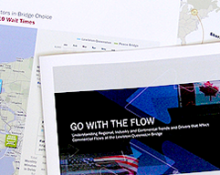 Situated on the front lines of this reality, the Niagara Falls Bridge Commission engaged the UB Regional Institute to examine industry trends for goods that flow across its bridges and how North American and regional trends and drivers currently affect – and will affect – the Commission’s border operations. The institute submitted its analysis to the Commission in spring 2011.